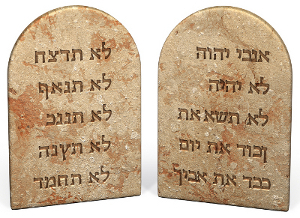 Must Christians Observe the Laws of Moses? There has been a trend in recent years to have Christians observe the Jewish feasts and Sabbaths. Is this optional, mandatory, or forbidden? The Old Testament never speaks of the church. It is only in the New Testament, especially the Letters (Rom. 11:25, 16:25, 1 Cor. 2:7, Eph. 1:9, 3:3-9, Col. 1:26-27, 2:2, and 4:3. ), where the “mystery” of the church is revealed. Not even the Gospels will tell us much about prophecies concerning the church, since Jesus stated clearly that his primary mission was to “the lost sheep of Israel” (Mat. 15:24). Neither will the events of Revelation be primarily about the church, which is never addressed as such after the seven letters in chapters two and three. The church is “not appointed to wrath” (1 Thes. 5:9) and has never shared in the guilt or prophecies of Israel. And no other righteous people from any other age before or after the church were promised the Holy Spirit as a deposit guaranteeing our inheritance (2 Cor. 1:22, 5:5, Eph. 1:13–14). Unlike the church, Israel was never described as the Body of Christ (1 Cor. 12:27, Eph. 4:12). In Eph. 3:6, which states that through the Gospel both Jew and Gentile are united into one Body, it also states that this unity is found “in Christ Jesus”. It does not say that Gentiles are absorbed into Israel. The OT is all about the Hebrew people, and nothing about the church, which "is not appointed to wrath", and which will be kept out of "the hour of trial that is going to come on the whole world to test the inhabitants of the earth" (Rev. 3:10). If one believes that Christians become Hebrews due to being "grafted in" to Israel, we have a problem: how can specific prophecies about the people of Israel, who are to be purified through wrath, apply to the people belonging to Jesus who are not to suffer that wrath? The 70th "week" is for Israel and the rebellious world. Our righteousness does not come from ourselves but from Christ, and God will not punish us any more than he’d punish Christ. Now let’s look at the passage most cited to teach that we are grafted into Israel: Romans 11. Paul begins by stating that God has not abandoned his people Israel, in spite of their callousness and blindness. He explains that this temporary situation has resulted in the salvation of the Gentiles (lit. Greek "nations"), until the "full number of Gentiles has come in" (vs. 25). Then in vs. 16 he begins the illustration of the root and branches. What or who is the root? It can’t be the branches, and both Israel ("natural") and the Gentiles ("wild") are branches. The branches, even the natural ones, are not the root. So the root is neither; it is Christ Jesus. It is Him into which we all are grafted, not one type of branch into another. In 1 Cor. 10:32 Paul lists three groups of people: Jews, Greeks (non-Jews, Gentiles, nations), and the church of God. In Gal. 3:28 he says that since we’re united in Jesus, there is no more division between Jew and Gentile, slave or free, not even male and female. Clearly, the church is not Israel. But who is "spiritual Israel"? Gal. 3:29 says that if we belong to Christ then we are "the seed of Abraham and heirs according to the promise", but remember that Israel did not exist before Abraham’s grandson Jacob (whose name God changed to Israel). It requires more than the faith of Abraham to be an Israelite. Gal. 3:15-21 makes it very clear that the promise to Abraham is completely separate from the laws of Moses. We see also in Gal. 6:16 that Paul again makes a distinction between the church and "the Israel of God". In context, Paul is contrasting those Jews who insisted upon obedience to the laws of Moses and those who believe salvation is by faith alone. In fact, Paul’s entire life as a Christian was spent battling with the "Judaizers" who demanded that Gentile Christians observe the law. This was also addressed at the Jerusalem Council in Acts 15, where it was decided that all the Gentiles needed to do was to be sensitive to the Jewish communities on the matters of not eating the blood of animals and abstaining from sexual immorality. So Paul distinguishes between true and false Jews, rather than calling Gentile Christians Jews or "spiritual Israel". We should also observe the incident in Galatians 2 where Paul confronted Peter publicly about his backsliding into Jewish practices: "You are a Jew, yet you live like a Gentile and not like a Jew. How is it, then, that you force Gentiles to follow Jewish customs?" (vs. 14b). And in vs. 19 he says that we "died to the law". He develops this thought further in chapter 3; the Law served a purpose but that purpose has been achieved. How can the law apply to a dead person? It can’t. Now of course, this hardly means we have a license to sin. We not only died to the law but also to sin (Rom. 6:2). If we truly understand what Jesus did for us, we will be grateful; if we truly grasp the meaning of "reconciliation" (2 Cor. 5:18-21); we will behave accordingly. Do we claim to reconcile with someone and then either ignore them or continually do things that irritate them? Then why would anyone think that we should live in sin just because we’re not under Law? As it says in 1 Tim. 1:8-11, laws are for the ungodly; the righteous don’t need them, because we live to please God. If we’re only good because there’s a law, our "goodness" is worthless. Christians are not Jews, even if they used to be Jews, and Gentiles were never Jews at all. Observing the feasts or Sabbaths is exactly the kind of legalism Paul opposed (see also Colossians 2:8, 16-17, 20-23). In fact, much of what Paul wrote was in response to continual persecution from legalists trying to put Christians under the laws of Moses. And the law cannot be partially practiced, as if we are bound only by things that don’t require a temple and priesthood. The entire letter to the Hebrews (which I am convinced was not written by Paul), especially chapter 7, is all about why the law is a unit that requires a temple and priesthood. Verse 12 says that when the priesthood is changed, the law must be changed also. And since we as Christians are not under the priesthood of Levi or Aaron but Melchizedek (which priesthood is held by Jesus forever), then we cannot be under any part of the laws of Moses. So the church is not to observe the festivals, the laws even partially, or anything else connected to the laws of Moses. The church is unique, the only entity given the Holy Spirit as "a deposit guaranteeing our inheritance" (2 Cor. 1:22, 5:5). We are free in Christ— not to sin, but from sin. Jesus fulfilled it all, so anyone who is united with Him has also met its requirements. To continue trying to practice the laws of Moses is, in my opinion, an insult to the finished work of Christ on our behalf. I do not condemn those who disagree with me on this, but I implore you to carefully consider the teachings of the New Testament on this matter.